The Four Percent Rule | Does It Work or Are There Better Options? The four percent rule helps financial planners and retirees decide how much money to withdraw from a retirement account every year. The guideline states that a person could withdraw 4 percent of his or her portfolio in the first year of retirement and then adjust that percentage to account for inflation each year for roughly 30 years without running out of money. In his post, Walsh argues for offering annuity products as qualified default investment alternatives (QDIA). A currently available alternative for retirees is to buy an immediate annuity, which would guarantee a steady lifetime income. And many experts advise both purchasing an annuity and applying the four percent rule when withdrawing funds from a retirement account to ensure you don’t outlive your retirement savings. How Does the Four Percent Rule Work? In 1994, financial planner William Bengen faced that question from clients who were nearing retirement. Bengen decided to research investment performances from 1926 to 1976 to see how various withdrawal rates would have affected retirement portfolios. Bengen came up with the four percent rule. According to Bengen’s rule, a retiree with a portfolio of 50 percent stocks and 50 percent bonds will not outlive the funds if he or she withdraws 4 percent of the account balance the first year of retirement and then adjusts the withdrawal amount for inflation in each year thereafter. The rule assumes the portfolio would have to last for at least 30 years. “Assuming a minimum requirement of 30 years of portfolio longevity, a first-year withdrawal of 4 percent, followed by inflation-adjusted withdrawals in subsequent years, should be safe,” Bengen wrote in his 1994 study, Determining Withdrawal Rates Using Historical Data. But because it’s based on past performances of the markets, the rule won’t necessarily predict the future. And any given year could make or break a retiree’s financial security. Bengen has since adjusted the rule to 4.5 percent for the first year’s withdrawal. The first year, the retiree would withdraw $4,500. Assume inflation that year is 10 percent. Then, in the second year, the retiree would take out $4,950. “I looked for the worst case, meaning periods when the portfolio ran out of money the soonest. That’s what the 4.5 percent safe withdrawal is based on: that unlucky investor who retired in October of 1968 and ran into some terrible stock markets and terrible inflation,” Bergen said in an interview with vice president of the American Association of Individual Investors, Charles Rotblut. People have weathered poorly performing stock markets so far using the four percent rule, Bengen said. But if high inflation were to set in for 10 years or more, it could have a negative impact on the usefulness of the rule. 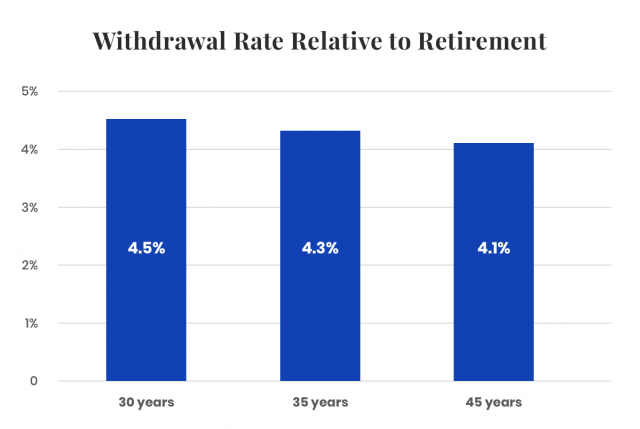 Also, if retirement lasts longer than 30 years, the rate of safe withdrawal over time would be lower. Bengen says if retirement lasts 35 years, for example, the rule would be 4.3 percent. He subtracts 0.1 percent for every additional five years of retirement. So 45 years of retirement would result in a 4.1 percent rule. The trick is knowing how long you’ll live. “If you plan to live forever, 4 percent should do it,” Bergen said in a 2018 Forbes article. In his description of the rule, Bengen acknowledged its shortcomings. Predicting the future is a fraught exercise to start. And when it involves people’s financial survival and comfort, the stakes are high. Financial advisors attack the rule as either not allowing retirees to withdraw enough money or suggesting withdrawals that are too high. The number of assumptions involved in executing the rule and the unknowns of the economy moving forward are two big issues. One assumption is that your portfolio comprises 60 percent stocks and 40 percent bonds. Changing that balance would affect the usefulness of the rule. Changing performances in the stock market can have a major impact on the return of a retirement portfolio. Any significant downturn can throw off the rule. Others have noted that historically low interest rates signify that bonds are yielding much less than they have in the past. And life spans are getting longer, which means people may need retirement funds beyond the 30 years the rule is designed to cover. Some financial advisors say the rule isn’t flexible enough to account for changing income needs. For example, people typically spend and travel more in the early years of retirement and have higher medical expenses later on. The best approach for retirees considering the rule might be to follow it, but also keep a close eye on their portfolios and make adjustments as needed for changing expenses and market conditions. Wade Pfau, a professor of retirement income at The American College of Financial Services noted in a 2017 Forbes article that the 4 percent rule is for retirees who want to be safe. More risk-tolerant retirees might opt to withdraw as much as 7 percent in the first year, he wrote.